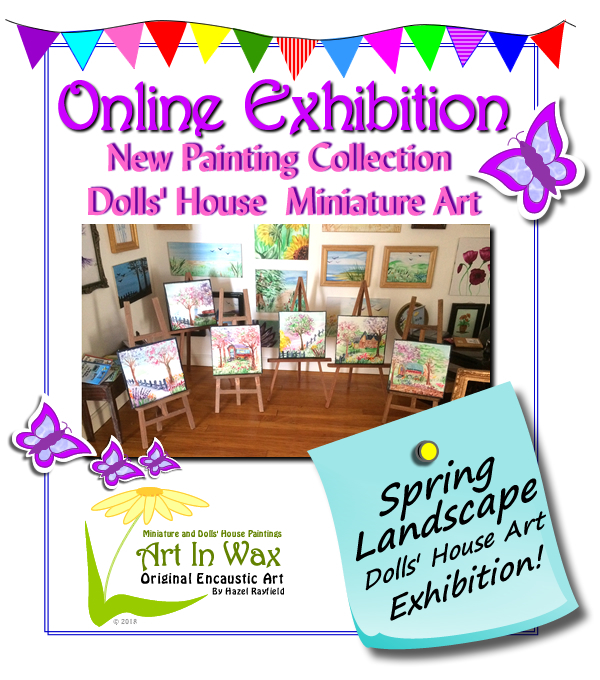 Today I have launched a new collection of my miniature dollhouse art, this is a mini exhibit on my art exhibition page here on the Art In Wax website, the exhibition has 6 dolls house size paintings, all painted this month, January 2018. I was inspired to paint these pretty Spring landscapes, as it been a cold month and I love Spring so this was what I came up with while thinking of fresh Spring days to come. Each painting in the collection is 2 x 2 inches, and are a variety of landscapes, not a theme as such but each in a similar style and feel to the others in this collection, pretty countries walks with the blossom in the trees, two have vintage style caravans in a countryside setting, maybe a glamping holiday retreat ? Another has a pretty cottage in the distance and one has a river or canal boat in the scenic setting. They are shown on display in my own 1:12 scale “dolls house” size miniature property, which is an Art Gallery named The Gallery. If you have read me blog before you will know The Gallery is my folly and a lovely miniature property built for me by my husband Adrian for me to house some of my own miniature pictures, which are forever changing. 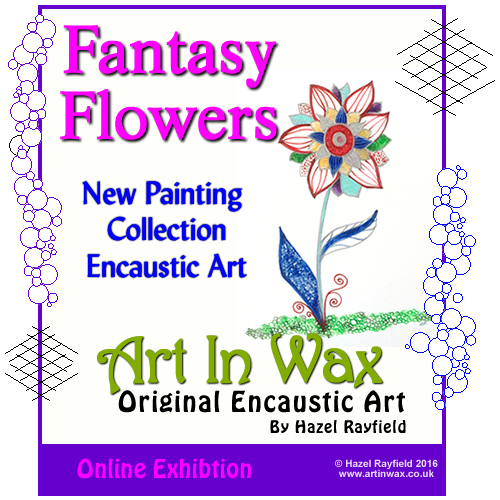 To see more of these paintings please visit the Art In Wax Miniature Exhibition Page. 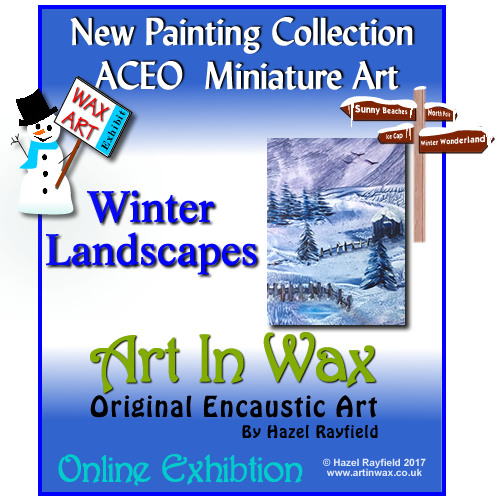 This month sees the launch of a new exhibition page on Art In Wax, the new exhibition is a collection of my miniature art, and features 6 ACEO size paintings with a winter theme. ACEO ( Art Card Originals and Editions) are size 3.5 x 2.5 inches. My “winter Wonderland” style paintings have always been popular from tiny miniatures to wall size paintings, so it seemed apt that my latest series for the Exhibition page would be in this seasonal theme. Please visit the Exhibit page to see this new series of miniatures pictures on display. Winter Theme Miniature Art In Wax Exhibition. If you would like to purchase one of my miniature ACEO paintings please visit the ACEO shop page. These paintings are for sale, if you don’t see them in the shop please contact me. If the painting you especially like is sold, I am happy to paint commissions in this style too. This weekend has been great fun !!! 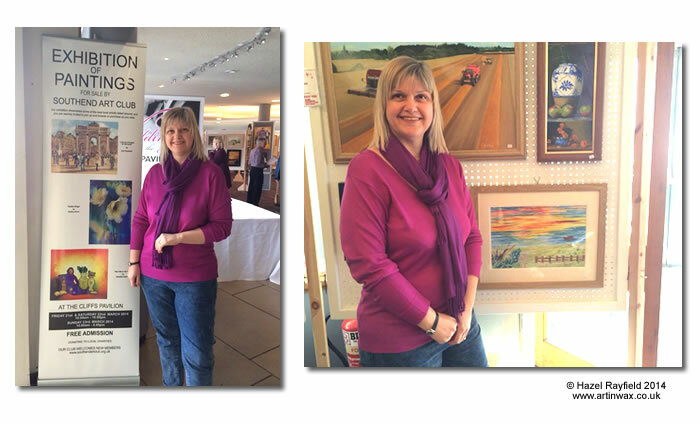 Showing some of my Art In Wax and viewing some amazing art by local artists at the Southend on Sea Art Club “Spring Exhibition of Paintings”. We, Adrian and I attended to the private viewing and reception opened by Sir Teddy Taylor on Thursday Evening which had a wonderful turnout, we got to see the art on display, over 300 pieces and a great mix of subjects and styles in all sorts of medium ….. we have some very talented artists in this area and they were on show in all their glory this weekend. This was my first time showing Art In Wax in a large exhibition like this and my pictures were the only Encaustic Art works in the show, it was great to talk to people about working in hot wax. It was good to meet some of the artists, Pauline Grove, who I have met before was there with some of her wonderful pieces, also great to see in person some of the work I have only seen online before through connections on Facebook, such as the work of Sharon Stone and Lori Wiseman who have kindly given their permission to show a couple of their pieces from the exhibition in this blog post. Thank you to Roy Bull from the Southend Art Club committee for sending me this picture of the award winners from the weekend exhibition and the press release below. 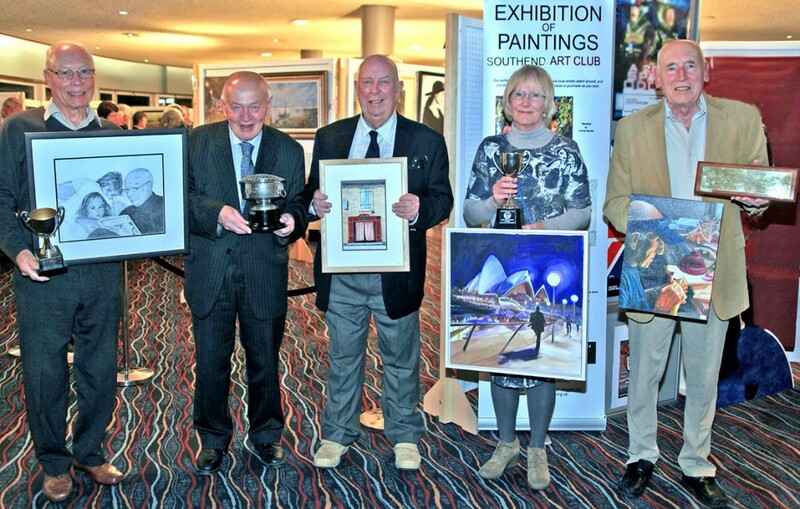 Sir Teddy Taylor opened an exhibition of paintings by the Southend Art Club at the Cliffs Pavilion, Westcliff, on Thursday evening ( 20th March ). There was a record number of paintings on show, a total of 344, in an exhibition that delighted artists and public alike. With his usual wit and charm Sir Teddy Taylor gave a small speech and presented trophies to the winners of each category. Alan Hunter for best drawing, Sir Teddy Taylor, Norman Ventris for best watercolour, Joan McCluskey for best newcomer, Joe Morris for best painting in the exhibition. Anita Pickles for best oil, and Andrea Sinclair for best acrylic, were not there on that evening. Southend Art Club is possibly the largest art club in Britain and new members are always welcome. Alan Hunter for best drawing. Joe Morris for best painting in the exhibition.